●Presentation of various forms of visual arts, their respective famous artists, as well as famous examples. Japanese Comics and animation will also be covered. ●There is a simple question and answer quiz after looking through our information boards, one of which is a spot-the-difference challenge. Every participant will walk away with a Consolation Prize (Everyone gets a prize! ლ(́◉◞౪◟◉‵ლ)), and the chance to participate in our Lucky Draw! Out of which we will select 3 top lucky winners. ●There will be a mini “Graffiti Wall” next to our VAS booth, where you can leave behind your thoughts about visual arts, as well as to try out drawing. Pencils and markers will be provided. We are inviting the owner as a vendor and she will also be selling her crafted items. 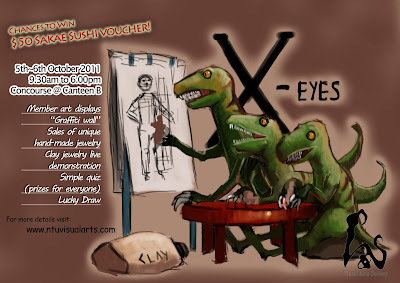 6th of October 2011, Live demonstrations from a clay jewelry artist from D’s Creation Singapore. We are also inviting her as one of our vendors and she will be selling her handmade work. Click here and participate Now! Hope to see you there! (/≧▽≦/) ! !